We offer a complete line of electromagnetic clutches, brakes and clutch-brake combinations in both standard and wafer sizes, originally designed for general military applications. These units can be designed for a wide range of input DC voltages, torque, response time, special temperature ranges, radiation, vacuum and life requirements. We have 18 basic models in five frame sizes, mainly 5,8,11,13 and 18, which have been designed to produce a balance between size, output torque, response time and drag torque, and where maximum torque-per-watt and size-per-weight ratios have been optimized. These units will meet the majority of applications. The most inherently-reliable and long-lived variable torque control clutch or brake, designed for constant tension and/or constant slip-type applications, is a hysteresis type unit. Hysteresis clutches and brakes exhibit a torque rise directly proportional to the applied current. The output torque of these units is independent of speed. 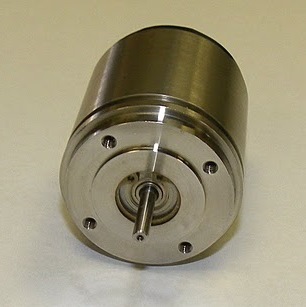 Because the coupling action is purely magnetic there is no physical contact between the coupling members; therefore the unit exhibits no wear or fluctuation of torque with respect to life. These brakes are designed for fast silent stop if the current fails. These unique brakes offer several mounting options, less noise, are asbestos-free with fast response time, long life and high torque vs. size and are available from 1.38"-to-3.12" diameter. Various other options are available including different voltages. The brakes typically are used in machine tools, printers, copiers and film drives. Agricultural applications such as irrigation and fertilizer dispersion demonstrate the versatility of these units and their ability to function under different and adverse conditions. See Failsafe Brakes. These clutches and brakes are manufactured for high-volume utilization where cost is considered paramount. They are incorporated in copying machines, air conditioning equipment, sewing machines, automated machine tools, packaging equipment and a host of other devices. Ask for our technical specifications illustrating a wide range of models and sizes for immediate delivery. A clutch/brake application is only limited by the designer’s imagination. If it can be done - we will do it!